*Authorized Dura Supreme Cabinetry* *Authorized Canyon Creek Cabinetry* We work with homeowners who are busy professionals working long days or running their kids to multiple activities and don't have hours to spend in showrooms. They have tried working with architects and are overwhelmed when they are sent to select materials on their own or they are frustrated when they can't read their drawings or visualize their new kitchen and bath remodel. Usually they are trying to make responsible investment decisions but are secretly worried they may make choices they decide they don’t like until it is too late. We typically work with people who live in Alameda, Albany, Berkeley, Kensington, Lafayette, Oakland, Piedmont, San Francisco, and Walnut Creek. Kattenburg Architects, founded in 1981, is an Orinda, CA firm of architectural design professionals emphasizing responsive full-service project development. Mattingly Thaler Architecture is an architectural, planning and interior design firm with a broad range of projects and experience. Our firm was founded in 1988, and we pursue two key goals: excellence in design and the provision of the highest level of professional service to each client. 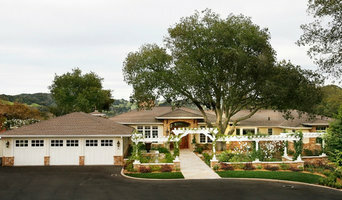 Our experience includes high quality custom homes throughout Northern California, high schools and middle schools, dormitories, cafeterias and libraries, residential and commercial interiors, retail and office space, galleries, restaurants, office space planning, theaters, and children's playhouses, along with custom cabinetry and a broad range of custom furniture. Our design process is collaborative: we emphasize a close working relationship with our client, the project team and the local community as the project progresses through each phase of the design process. Instead of architecture being valued for its ability to adhere to a single style or for its use of the latest trends, we believe that the richness of each building and the beauty of any space will be found individually, according to the recognition, acknowledgment and response to the desires, needs and aesthetic concerns which are integral to each design and every act of building. Each project is seen as a partnership between the client, the architect and the specific context. While we intend our architecture to work in the world of art, we do not impose pre-conceived solutions or pursue eccentric innovation for its own sake. The design process shapes and is shaped by the client's ideal program, the specific needs for both now and planned for the future, the geographic location of the project and economic constraints placed on the construction. We are dedicated to the resolution of the inherent contradictions in life and to finding a true balance between desires and reality. We strive to meet the architectural needs of our Clients through creative, technology-based design practices, time-sensitive and cost-effective execution, and unparalleled quality and service. I have a passion for creating new designs that will reinvent your space. From a simple color consultation to a full scale remodel, my ultimate goal always remains to create spaces which reflect both the personality and interests of each individual client, while meeting the specific functional needs of their lifestyle. I apply my wealth of experience in the design field along with a variety of industry contacts to guide my clients through the process of realizing their unique dream space. CB Design specializes in remodels, additions as well as ground-up construction, and interior architecture. We serve the greater San Francisco Metro Area. We are an Award-Winning design firm that specializes in living spaces transformed. 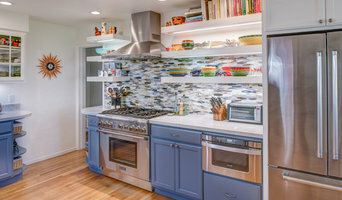 With nearly 20 years of experience designing & building kitchens & baths in our community and we've built a solid reputation and a long list of happy, satisfied clients -- many of whom have become good friends. When we began this business, we brought to it our own perspectives as home owners living in this remarkable community. The omnipresent challenges of limited space, older architecture and substantial construction costs have shaped the way we do business and work with our clients. Your home is your single largest investment and providing a real and lasting value is our core objective when working with you to remodel your kitchen or bath. We've also built an extensive professional resource network of Structural Engineers, Builders and trade specialists who enable us to offer you the best possible remodeling experience and lasting value. We love collaborating with our clients -- we'll help you transform your current kitchen or bathroom into the fabulous new space you've always wanted. 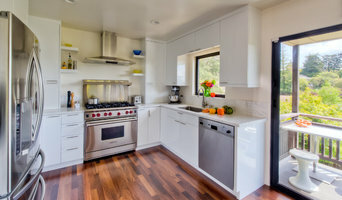 We specialize in creative, thoughtful design (always keeping the house in mind) -- from traditional to transitional to contemporary -- and with our exceptional quality, yet very affordable green cabinetry, distinctive & unique eco-friendly counter top materials, cabinet hardware, decorative tile and plumbing fixtures you're sure to find everything you need at a very budget-friendly price. 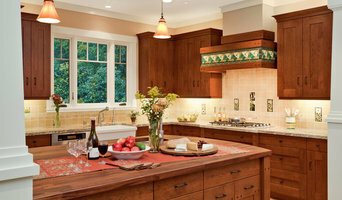 Alexis Dongallo Design is a full service residential design and staging company for serving the bay area. We are dedicated to creating functional, beautiful and personalized spaces for our clients. Each client is unique and so is their project. The fees associated with the scope and range of the work is tailored to fit each and every project. Please, feel free to contact me at your convenience. Braver Designs can help you navigate the design and construction process. We help sketch up your design ideas, create construction documents, coordinate with many consultants and the city. Studio Maven is a design firm based in the San Francisco Bay Area. We provide services for residential, commercial, and retail clients, for projects at all scales. Our collaborative process and our rigorous approach to design, detail and finish will bring your space to its best potential. Our practice is suited to the 21st century client. We can collaborate both in person and online and can produce work in a virtually paperless office. As with many of our projects, we we work toward best practices in resource conservation and efficiency. I love designing buildings! I am the owner and principal designer at Home and Temple Design. I like to work closely with my clients, which yields the best results when I concentrate on it personally. We believe in bringing the bay area quality work for all of your General Contracting needs! For over 20 years Strong Tower Construction has been doing remodels, designs, kitchens and baths. Todd Jersey Architecture is one of the nation's leading sustainable design firms. Todd and his staff have been leaders in the field of earth-friendly design since 1989. Todd has spent the last 30 years designing and building some of California's most beautiful and sustainable projects including the world's first LEED Gold hotel and the nation's greenest and healthiest indoor pool, the historic Richmond Plunge. As a national leader in the field of sustainable design, Todd Jersey Architecture has completed well over 300 projects. Many of our works have received wide acclaim for excellence in design. Our projects range in size and type from residential remodels and commercial tenant improvements to new hotels, mixed use urban infill and most recently designs for a new transit system. We have experience in almost every imaginable building system from straw and rammed earth to steel and concrete and have equal facility with new construction and historic preservation. Todd Jersey is passionate about both the preservation of historic structures and sustainable design. The blending of these two passions created what is widely acclaimed as one of the nation's best examples of green historic preservation in the award-winning designs for the restoration and renovation of the venerable Richmond Plunge. Having begun an apprenticeship with a master carpenter at the age of 16, Mr. Jersey brings 40 years of experience and expertise to the field of residential design and construction. 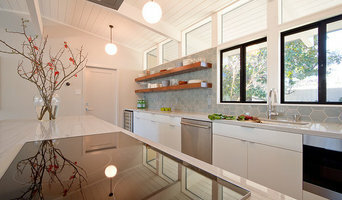 His innovative sustainable designs for new home and remodeling work have been featured in Sunset and Natural Home magazine. Todd Jersey won a national award for a middle school design done in 1988-1989 while working as a project architect for HMFH Architects in Cambridge, Mass. In the mid-1990's, Mr. Jersey designed the building which now houses Bayhill High School in Berkeley, Calif, one of the early examples of urban ecological design which Todd was pioneering at that time. The mission of the firm is to create projects that optimally support human needs while protecting and enhancing the earth's ecological systems. Prices range from $100,000 and up. Typical residential projects include entire home remodels, entire structure remodel, new residences, accessory dwelling units, multi-family housing, historic preservation and more. We are a full-service design company helping you plan, manage and design all aspects of your interior design or remodeling project. Specializing in traditional Contemporary and Arts & Crafts design, residential and commercial architecture and Interior design with an emphasis on green & sustainable design, serving the greater Bay area and based in Alameda. As dealers of more than twenty companies, we will guide you through the full process of your project from design and selection all the way through the construction and installation. Call us today! Kriste Michelini Interiors specializes in classic, timeless interiors with modern simplicity. We design well-edited spaces for our clients that are both beautiful as well as functional.